The Danish-Estonian Chamber of Commerce invites you to an exclusive celebration: the start of the new season with us at a yet unopened, brand new restaurant in the old town of Tallinn. We invite you and your friends to a late spring, early summer event at a restaurant of two owners fascinated about food - "Leib Resto ja Aed" on Uus 31. We welcome all members and friends for an entertaining Friday evening with us. Wanna know more about sparkling wines? Take part of Danish traditional party entertainment? Be part of an exclusive circle of friends invited to the newest restaurant in town? It's all there along with summer grill buffet and special surprises. Welcome to the summer-opening with DECC! Entrance: 25 € for DECC members, 32 € for non-members. 2011-05-27 16:30:00 2011-05-27 00:00:00 Europe/Tallinn DECC invites: Summer Start! New, luxurious hotel, in the heart of the city, is housed in a characterful old building, once an exchange of the Estonian Telegraph Company. 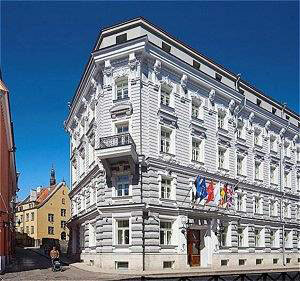 Recently transformed into a hotel, the building offers you both history and modernity.